M. Frederick Hawthorne was born in Fort Scott, Kansas and he received his elementary and secondary education in Kansas and Missouri. Prior to high school graduation, through examination he entered the Missouri School of Mines and Metallurgy, Rolla, Missouri as a chemical engineering student. He then transferred to Pomona College, Claremont, California and received a B.A. degree in chemistry. Hawthorne immediately commenced graduate work in organic chemistry at the University of California, Los Angeles, where he received his Ph.D. Iowa State University, Ames, Iowa then attracted Hawthorne as a postdoctoral associate (physical-organic chemistry) for a period of sixteen months. He joined the Rohm and Haas Company, Redstone Arsenal Research Division, Huntsville, Alabama as a Senior Research Chemist. Hawthorne launched his career in borane cluster chemistry by organizing and leading the Organometallic Chemistry Group at Rohm and Haas, Redstone. While on leave of absence from Rohm and Haas he served as a Visiting Lecturer in physical-organic chemistry at Harvard University, Cambridge, Massachusetts. Hawthorne served as a Laboratory Head at the Rohm and Haas Co., Philadelphia, Pennsylvania and in 1962, he became a full Professor at the University of California, Riverside. He transferred to his present position at the Los Angeles campus in 1969. In 1998 he was appointed University Professor of Chemistry, the most distinguished title bestowed upon faculty by the Regents of the University of California. Hawthorne joins twenty colleagues sharing this title University-wide. Hawthorne is the author or co-author of more than 500 research papers, 30 patents and 10 book chapters that reflect the joint efforts of approximately 200 Ph.D. students and postdoctoral associates and 11 Ph.D. coworkers at Rohm and Haas, Redstone. His students and postdoctoral associates represent 21 different countries and 35 of them now occupy academic positions. One of them was a space shuttle astronaut; Anna Lee Fisher (née Sims), M.S. (chemistry), M.D. Hawthorne's research work has been internationally recognized and widely honored. In 1963, he was awarded an Alfred P. Sloan Research Fellowship and in 1968, he was presented the Chancellor's Award for Research at the University of California, Riverside. Hawthorne received the UCLA McCoy Award for Contributions to Chemistry in 1972, and the American Chemical Society Award in Inorganic Chemistry in 1973. In 1973, he was elected to membership in the U.S. National Academy of Sciences at the age of 44. Pomona College awarded Hawthorne an Honorary Sc.D. degree in 1974 and he was elected a member of the American Academy of Arts and Sciences in 1975. The Cosmos Club, Washington, D.C., elected Hawthorne to membership in 1976. In 1980, he was elected a Fellow in the American Association for the Advancement of Science. The U. S. Air Force presented Hawthorne the Meritorious Civilian Service Medal in 1986 and he received the Richard C. Tolman Medal Award of the Southern California Section of the American Chemical Society that same year. He was a Fellow of the Japan Society for the Promotion of Science in 1986, and lectured throughout Japan. In recognition of his seminal contributions to borane cluster chemistry Hawthorne was the first recipient of the Boron USA Award for Distinguished Achievements in Boron Chemistry in 1988. In 1988, he was the recipient of the American Chemical Society Award for Distinguished Service in the Advancement of Inorganic Chemistry. In 1990, Hawthorne became the recipient of an Alexander von Humboldt Foundation Award for Senior U.S. Scientists. In addition, The Ohio State University appointed Hawthorne Distinguished Visiting Professor during the autumn of 1990. He received the Bailar Medal for Achievement in Inorganic Chemistry in 1991. In 1992, Hawthorne was awarded the Ph.D., honoris causa, by Uppsala University, Uppsala, Sweden. He was the recipient of the 1993 Polyhedron Medal and Prize for Creativity in Inorganic and Organometallic Chemistry. In 1994, he was selected for a Chemical Pioneer Award of the American Institute of Chemists and he was the 1994 recipient of the Willard Gibbs Medal presented by the Chicago Section of the American Chemical Society. Hawthorne was elected a Corresponding Member of the Göttingen Academy of Sciences in 1995. Hawthorne was the first recipient of the Award for Polyhedral Borane Chemistry presented by the IMEBORON International Committee on Boron Chemistry in 1996. In 1997 he was the recipient of the U.S. National Academy of Sciences Award in Chemical Sciences and the Seaborg Medal presented by the UCLA Association of Chemists and Biochemists. The Royal Society of Chemistry recognized Hawthorne with a Centenary Lectureship in 1998. He won the Basolo Medal of the Chicago Section of the American Chemical Society in 2001. 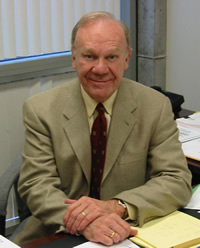 In 2003, Hawthorne was a co-winner of the King Faisal International Prize for Science and was honored by the Georgia Institute of Technology Chapter of Sigma Xi Society with the Monie A. Ferst Award.